Перечень запасных частей, техническая информация, руководства по ремонту, каталоги, справочники STIHL от первого квартала 2012 года. mediaCAT is a member of the eVision Technologies family of products. mediaCAT is an export module plug-in for eVision mediaBASE that produces a multi-media electronic catalog CD-ROM master. The CD-ROM master image contains both the eVision mediaCAT viewing software product and the electronic catalogs you wish to distribute. The mediaCAT viewing software can be integrated with proprietary e-business transaction systems (e.g. ordering, warranty, etc.) or eVisions own suite of integrated e-business solutions. Headquartered in Milan, Italy, eVision Technologies Group has over 15 years of digital media asset management and database publishing experience. eVision products include mediaBASE; a comprehensive and complete environment for managing digital media assets, mediaCAT and mediaWEBCAT; a robust suite of products for delivering and accessing electronic catalogs via CDROM or web-based technology, mediaPDF and mediaFICHE; a publishing suite of products for producing pre-press ready print or microfiche documents and mediaSTREAM; a powerful desktop publishing software allowing to freely design product documents while interactively accessing media assets of the relational database mediaBASE. 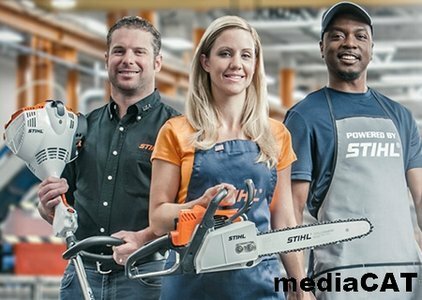 STIHL Inc. manufactures the world’s largest selling brand of chain saws and produces a full line of powerful, lightweight, and versatile handheld outdoor power equipment for homeowners and professional users. STIHL products are sold through independent servicing power equipment retailers from coast to coast. The STIHL product line features some of the best available technologies and some of the cleanest running outdoor power equipment available today.